For several years, I've been emphasizing how identifying logical fallacies can not only sharpen our own presentations, but help us spot deception coming from certain people. While I focus on evolution, creation science, and theology, it's easy to see how sneaky wording is used in other areas, especially those that are politically oriented. It seems to be increasingly important to have people to define their terms, and to nail down an understanding for a discussion, debate, or reporting. That is because there is a great deal of deliberate confusion going on, especially regarding connotations of loaded words. One of my favorite examples is "fundamentalist". That word is often used as a pejorative because of the connotations of a dour legalist, and the definitions are flexible; Calvinists, Lutherans, me, others can be considered fundamentalists because we believe in the fundamentals of the faith (well, duh). Many of us don't cotton to that label because a fuller definition makes important distinctions; I'm not a Fundamentalist per se. In discussions on evolution, definitions are very important, especially since some anti-creationist sidewinders will pull a bait 'n' switch on definitions (fallacy of equivocation). They also play other word games, and you can catch them in their double standards. We even have to define evolution so we don't talk past each other, or get manipulated by unscrupulous folks. where they are falsely identified as "assault rifles". Another example is the term "assault rifle". Leftists keep using that term, and it does not mean what they think it means. 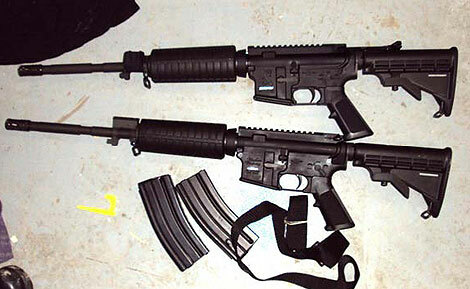 The above image was liberated from a government site that identified the guns as "assault rifles". Apparently, the CBP Public Affairs writer doesn't know what defines a real assault rifle. Or perhaps this term was intentionally used to provoke emotions? I don't reckon I know for certain. For a good article on the correct definition, see "So What Is an ‘Assault Rifle’ Really? We Look at the Definitions and How the Term Is ‘Demonized’". What really gave me a burr under the saddle about this word usage topic again was disinformation from the leftist media about the number of "mass shootings this year". The term mass shootings is emotionally-charged, and some people have the connotation of someone going into a cinema or shopping center and killing a number of bystanders, or Mohammedan terrorists killing people. (Don't get me started on how many of those mass shootings happened in so-called "gun-free zones".) Many mass shootings are related to gang violence and various disputes, so the connotation can be misleading. The figure about mass shootings this year (2015) was not only outrageously wrong, but the media did not bother to do any fact-checking — it came from someone on Reddit who had his own definition of "mass shooting". The Reddit version has a number of mass shootings for this year that is in excess of the number of the mass shootings according to the Congressional Research Service from 1999-2013! I recommend for your reading "The Media Keeps Saying There Have Been 355 Mass Shootings This Year. That's a Lie." Not only do we have to be wary of what we're being told, but to keep an eye out for logical fallacies — especially manipulation through obfuscations of definitions.